South Korean police were not able to carry through with a pledge to enter a Ssangyong Motor Co. factory, which has been occupied by fired workers for almost two months, as the carmaker tries to resume production at the plant. About 800 fired employees were still in a paint shop, confronting more than 3,000 police as of 5:22p.m. in Seoul, Ssangyong spokesman Cha Ki Woong said by phone at the plant in Pyeongtaek, where the automaker is based. Ssangyong came under court control in February, after facing a “serious” cash shortage as the global recession damped demand for the automaker’s sport-utility vehicles while it lost domestic customers to Hyundai Motor Co. and Kia Motors Corp. The occupation has caused production losses of about 10,800 vehicles worth 230 billion won ($183 million) as of July 15, according to the automaker. The Gyeonggi Provincial Police Agency said earlier today it will enter the factory to assist a court officer demanding the former employees leave the factory. The court officer left after failing to deliver the document, said Ssangyong’s Cha. Police spokesman Kim Dong Ho declined to comment. A strikebreaking Ssangyong worker was hit by a projectile from the occupied factory and was sent to the hospital. Ssangyong plans to eliminate 36 percent of its workforce to return to profit and meet a Sept. 15 court deadline to submit a restructuring plan to avoid liquidation. 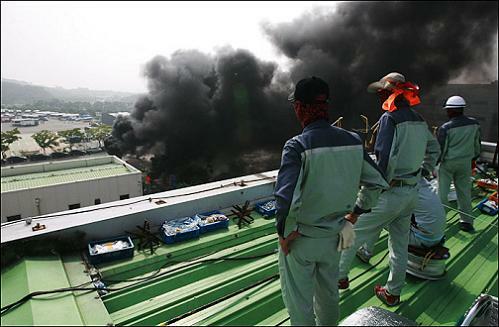 About 800 workers are still in the plant and they’ll resist “in the face of death” if police tries to forcibly disperse them, union spokesman Lee Chang Kun said by phone. The output losses at Ssangyong will rise to 14,590 vehicles worth 316 billion won by the end of July if the former workers continue the occupation, which has stopped Ssangyong’s production entirely. Last month, an attempt to retake the factory resulted in between 10 and 20 injuries as company-hired security guards and the occupying workers scuffled.